The first ever Straight and Curly book is here! Then I shelved the idea because going through and cleaning up the transcripts was a huge job that neither Carly nor I had any time for. This year, we revisited the idea, and decided to just make it happen already. 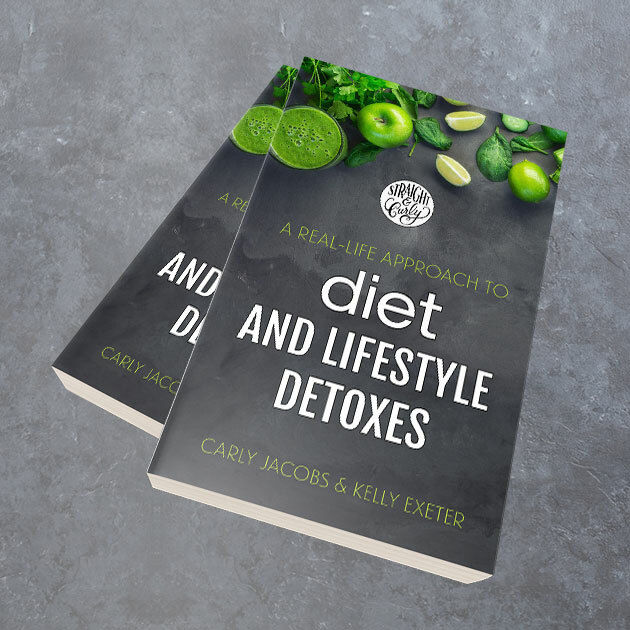 The three-part series we did on Diet mid-2016 was incredibly popular with our listeners so those were obvious ones to make the book. From there, we decided the episodes we did on Lifestyle Detoxes involving alcohol, coffee and phones would complement the diet ones well. Carly: So Kel, technically Straight and Curly is on an end of season break but we’ve got something quite exciting going on so we thought we’d record a special bonus episode of the show to let everyone know about it. Kelly: Yes! Last year we got our first 30 odd shows transcribed because a few listeners had let us know they liked being able to read over episodes. When I got those transcriptions back I thought to myself, gee there’s some good info in here, I wonder if we could turn these into a book of sorts. Carly: Yes, I remember you making the suggestion … and then we never did anything about it! Kelly: (Laughs) I know! I think it’s because I went through one transcript and was a bit horrified at how much it needed cleaning up. Nothing like reading a transcript to find out how much you talk in circles. I’m also really bad with starting a sentence with one thought, and then shooting off on another! Anyway, you and I revisited the book idea this year and decided to just do it already. So, being good Upholders, we did. Do you want to share a bit about how the book is structured? Carly: Yes. 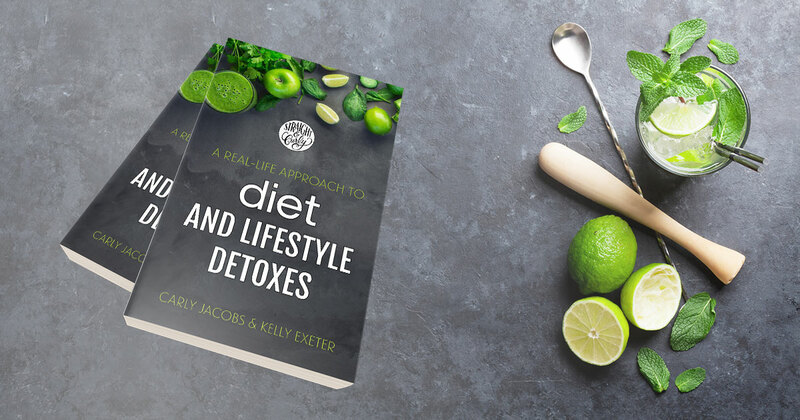 So the book is called A Real-Life Approach to Diet and Lifestyle Detoxes and is made up of eight very heavily edited show transcripts. Four of the shows were on the topic of diet and four of the shows were on the topic of lifestyle detoxes – sharing about the digital detox you and I did last year + the times we both gave up coffee for a month and alcohol for a month. The reason I’m emphasising the ‘heavily’ edited part is because I don’t want people thinking we just grabbed 8 show transcripts, threw them together in a book, and bob’s your uncle. No, we wanted them to be very readable and also, in editing them we were able to bring a bit more clarity to thoughts we shared in the shows. When you’re recording live, sometimes you can be overly definitive about something that’s in the grey. And conversely, sometimes you can dance around something that you’re actually quite black and white about. Kelly: Yes, how horrible was it editing the transcripts. Remember that text message thread we had where we were both ‘OMG’. But I will say, I’m pretty happy with where we got the book to. We gave it to 8 people in the Straight and Curly Facebook group to read and 7 out of the 8 loved it. One person said she didn’t love it, but that’s because she much much prefers listening to reading. And I thank her – it was Dena – for being so honest. Carly: Yeah, I guess that’s a little warning for anyone contemplating buying the book. If you’re more of an auditory learner than a visual learner, you’ll probably prefer to just listen to the shows. And we’ll link those up in the show notes of this Bonus Episode. Kelly: I have to admit I freaked out a little when Dena sent through her feedback because she was the first person to get back to me and I thought ‘Oh no, we’ve just put a huge amount of time and effort into producing this thing that no one will want!’ But then I remembered, I personally love scanning podcast show transcripts. Even the unedited ones. And I love printing out and reading over shows I’ve particularly enjoyed because I can go over and highlight things and refer back to them. So that comforted me a little. And then everyone else who read the book ahead of being released told me they were the same, they loved being able to revisit the shows. So Carls, I guess this is a good time to chat about what’s in the book and who might enjoy it? Kelly: And we don’t try things indiscriminately or jump on bandwagons. We do research our approaches quite heavily and if we’re going to give something a go, there’s a fair amount of intent behind it. We know the exact ‘why’ behind doing something. And we also take a very ‘do no harm’ approach. In that, we’re not going to go on the lemon detox diet because there is plenty of evidence out there that indicates this can cause harm to your body. But we’ll trial going without wheat for a month because no one with an otherwise balanced diet has experienced terrible health implications from removing wheat from their diet for a month. Carly: Yep, that’s right. So that’s basically what the book is, a collection of thoughts about where we’ve both gotten to with regard to how we eat as individuals. And we eat differently because we are two people with two very different bodies and metabolisms. And then we talk about the results of the lifestyle detoxes we did. Kelly: The lifestyle detox episodes were good because we were so different in how easy and hard we found them. I remember when we recorded the ‘Going without alcohol for a month’ episode. I was so blase about it because I hardly drink. So I was all very ‘If you go to the pub, just have a soda and lime instead of a beer.’ And you were like, Uh Kel, it’s not that easy. And then we took that month off coffee and I had to profusely apologise to all the regular drinkers of alcohol because going to a coffee shop and having a cup of tea instead of coffee made me want to punch myself in the face. Carly: Ha ha – yep. That was funny that coffee episode. So back to the book. Like everything we do in life, this book is an experiment. Will current listeners enjoy going back over these episodes and having them in book format? Let’s see. Will it bring new listeners to us? Will it attract people who like reading more than anything, but once they’ve read the book they’lll think ‘Hey, I need to go and listen to this show?’ We’ll see! All we know is, we’ve enjoyed putting the book together and we’re keen to do more. Kelly: Yep. I guess it’s also worth highlighting that it’s very difficult to monetise a podcast – especially when you’re an Australian podcast. Listeners have asked us how they can support the show beyond listening, subscribing on iTunes and leaving reviews. Well … grabbing this book is one way! We’ve made it available in every format: PDF, Kindle and Paperback. So hopefully one of those formats will suit the way you like to read, and your budget! Kelly: Yep – and that’s it really. We’ll be on end of season break for another couple of weeks and then we’ll be back with seven great episodes to finish out the year. Thanks so much for listening to this special bonusode! We’ll see you all in a couple of weeks!